A few days ago, a bunch of peaches sat ripening on the kitchen counter, slowly but surely reaching the point where they were almost too ripe. They needed to be eaten, and right away! 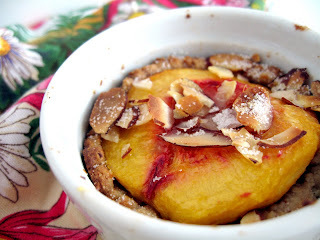 The problem nagged at me even in my subconscious, and as I woke up one morning, one of the first thoughts that filtered through my mind was the idea for these almond-crusted personal peach tarts. Each little ramekin holds a single portion, a peach half nestled in a cup of almond pastry dough and topped with crunchy toasted almond slices and granulated sugar. You'll want to have soft, perfectly ripe peaches for this recipe--mine were at the point where just some gentle work with a paring knife easily pulled the skins off--so that the peaches retain enough of their juiciness during baking. These little tarts are the perfect size to enjoy after a nice dinner, but they're so good that you might want to eat two of them...not that I'm speaking from personal experience or anything! And I love the presentation for these tarts...aren't they so cute? I used a fluted cutter to give the border a flirty edge. I also tried a "Version B," where I baked the tarts upside-down style. For this version I placed the peach halves cut-side down in buttered ramekins, and then I covered them with the almond dough, tucking it down over the edges of the peach. It resulted in super-soft and juicy fruit, but after unmolding them, the crust was fairly fragile, having absorbed much of the steam emitted from the baking peach, and they didn't seem to have the same cute presentation as my original version. Maybe it's just missing a dusting of powdered sugar as a finishing touch! But either way you make them, they're a great combination of flavors. 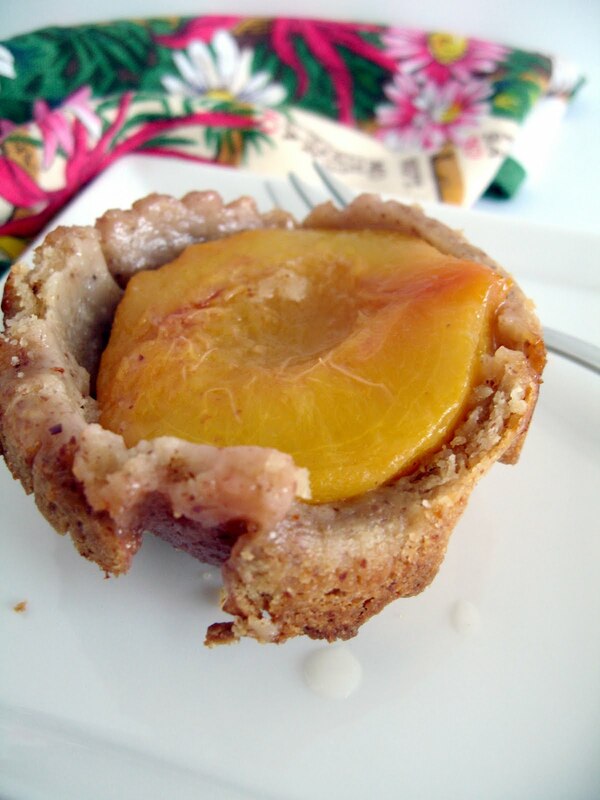 So next time you're at the store, grab a few extra peaches and try these tarts at home! In a food processor, grind together the almonds and sugar until a fine meal forms. Add the flour and salt and pulse to mix, then add the cold butter cubes and pulse until well blended. With the machine running, add ice-cold water one tablespoon at a time, until dough clumps together. Collect dough together and sandwich between plastic wrap, flattening into a large (~ 10-inch round) and thin disc. Chill in the refrigerator for about 30 minutes. Meanwhile, prepare peaches. Cut each peach in half (slicing through the crease down the side of the fruit), then twist the halves around the stone. One half should be easily released from the stone. Remove the stone from the other half (I find the tip of a knife helps to pry it out), and then carefully peel off the skin. 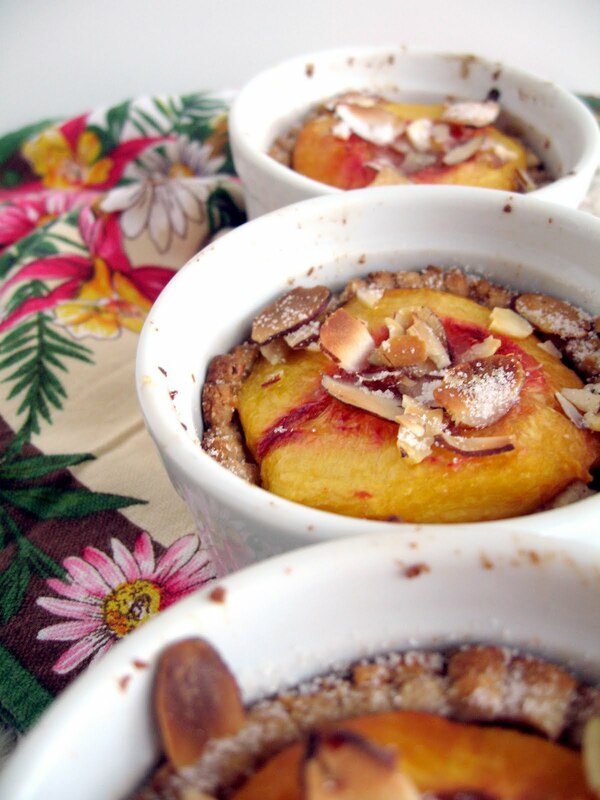 Line each of eight 3-inch diameter ramekins with a circle of dough, then fit a peach half, cut side up, snugly on top. Bake 15 minutes in at 375 F. Raise temperature to 400 F and sprinkle each peach with a 1/2 tablespoon slivered almonds and 1/2 teaspoon granulated sugar. Continue baking at 400 F for about 20 more minutes. These tarts are best enjoyed still slightly warm from the oven. These look really good. My dad's peach tree is not quite ready yet, but this will put his peaches to good use. Love the single portion idea! I have a plethora of peaches in my kitchen too! I just found your blog today...and I'm so glad that I did. 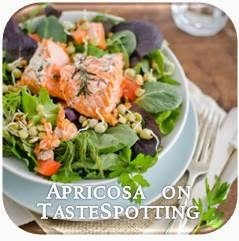 What lovely posts, recipe and photos! Wow! I am going to have to try this seeing that I live in the land of peaches - Georgia! - and have several of them sitting in my fruit bowl right now! Thanks for adding me in foodbuzz and for visiting my site today. Your blog is very beautiful especially the pictures are so amazing. I wish I know how to take picture like that. what perfect little tarts!! the almond dough was a nice touch! I actually had a similar problem a couple weeks ago with a bunch of peaches that were ripening a lot faster than I had expected (summer heat...), so I ended up grilling them slightly with balsamic vinegar and brown sugar. Next time I have the ripening peach problem, I'll try out these tarts! oooh Jonathan, your grilled peaches sound amazing! what a great idea!